In the final years of the nineteenth century, small groups of Muslim peddlers arrived at Ellis Island every summer, bags heavy with embroidered silks from their home villages in Bengal. The American demand for “Oriental goods” took these migrants on a curious path, from New Jersey’s beach boardwalks into the heart of the segregated South. Two decades later, hundreds of Indian Muslim seamen began jumping ship in New York and Baltimore, escaping the engine rooms of British steamers to find less brutal work onshore. As factory owners sought their labor and anti-Asian immigration laws closed in around them, these men built clandestine networks that stretched from the northeastern waterfront across the industrial Midwest. The stories of these early working-class migrants vividly contrast with our typical understanding of immigration. Vivek Bald’s meticulous reconstruction reveals a lost history of South Asian sojourning and life-making in the United States. At a time when Asian immigrants were vilified and criminalized, Bengali Muslims quietly became part of some of America’s most iconic neighborhoods of color, from Tremé in New Orleans to Detroit’s Black Bottom, from West Baltimore to Harlem. Many started families with Creole, Puerto Rican, and African American women. As steel and auto workers in the Midwest, as traders in the South, and as halal hot dog vendors on 125th Street, these immigrants created lives as remarkable as they are unknown. Their stories of ingenuity and intermixture challenge assumptions about assimilation and reveal cross-racial affinities beneath the surface of early twentieth-century America. 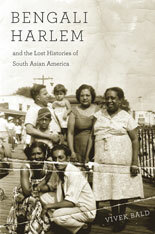 The title of the book is “Bengali Harlem and the Lost Histories of South Asian America”, however, is it primarily focused on Bengali in Harlem? Reason I am asking is because of an individual name Ruby Khan who arrived in the US around the late 1920’s in the Lower East Side and served in the US armed forces and was a veteran in WW 2 and lived in NYC till 2001. This individual is well known amongst majority of the Bangladesh communities in New York City, New Jersey, Philadelphia, Detroit, MI. All you have to do is simply ask any Bengali who has been in this country long enough to know. They’ll tell you everything. Who was Ruby Khan? Who to ask?